Sources and Methods of Historical Demography covers the fundamental sources, methods, and approaches to explanatory modeling for describing, analyzing, and understanding demographic features of past societies. The book discusses the intellectual ancestry of historical demographic research, beginning in the 17th century; as well as the logic of basic techniques for reconstructing and analyzing information from fundamental source materials. 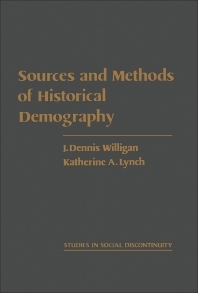 The text also describes the full range of disciplines that have made major contributions to historical demography, and examples of empirical research. The book concludes by arguing the case for conducting historical demographic research with a broad, interdisciplinary ideal in mind. Historians and sociologists will find the book invaluable. 21. Historical Demography and "Total History"